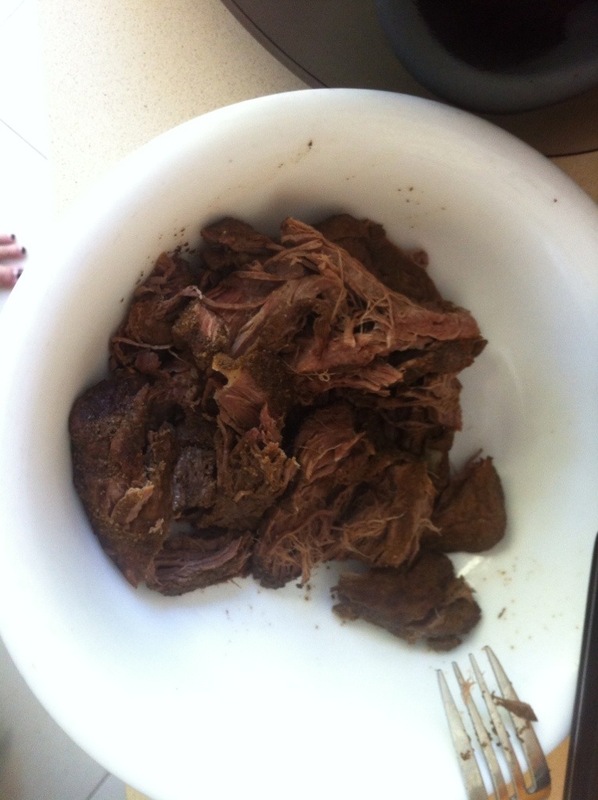 Recipe – Dukan & Paleo – There’s A Kangaroo in my Crockpot! I traveled here last Friday and what is wonderful about flying west is that you don’t have such bad jet lag. It’s the flying back east that does you in! It is summer here in Adelaide and the weather is glorious! I’ll do a post on the hikes I’ve been doing tomorrow, but today’s special is Roo! Tender, falling apart meat! The onions cooked down nicely and the gravy was yummy! 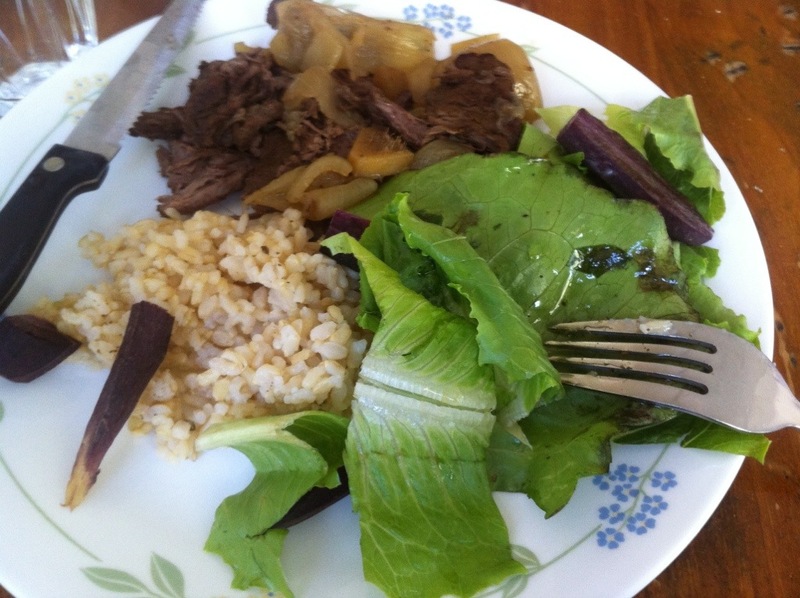 Plated with an organic salad and this was a perfect meal 🙂 I also enjoyed a 1/2 cup of rice and those purple things are carrots! I liked the meat. It wasn’t gamey at all. 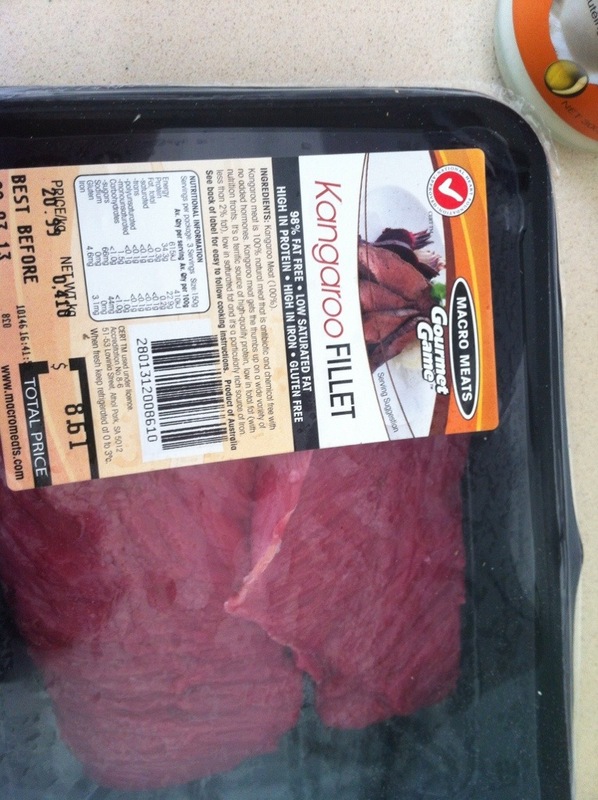 Reminded me of buffalo meat, but tastier and more tender. I would definitely try this again! Have you tried something different? How did you like it? Wow!!! 222 days since I met my goal weight… time sure flies. I’m nearly half way through the 500 days of Consolidation (it is 5 days for every pound you lost to your goal weight, which for me was 155, so 100 pounds lost… that said, I actually lost an additional 11 pounds for a total of 111 pounds, but I’m not counting those in my Consolidation #)… clear as mud? Since Thanksgiving I had gained 3.5 pounds. This brought me dangerously close to 150 pounds… On Friday I was 149.8. So I took action. I decided to do 4 Pure Protein days in a row this week. I started on Monday. Should have taken a picture BEFORE it was nearly devoured! 4 pounds chicken thighs (boneless/skinless) You could use breasts, but thighs are WAY CHEAPER!!! Turn your crockpot to HIGH. 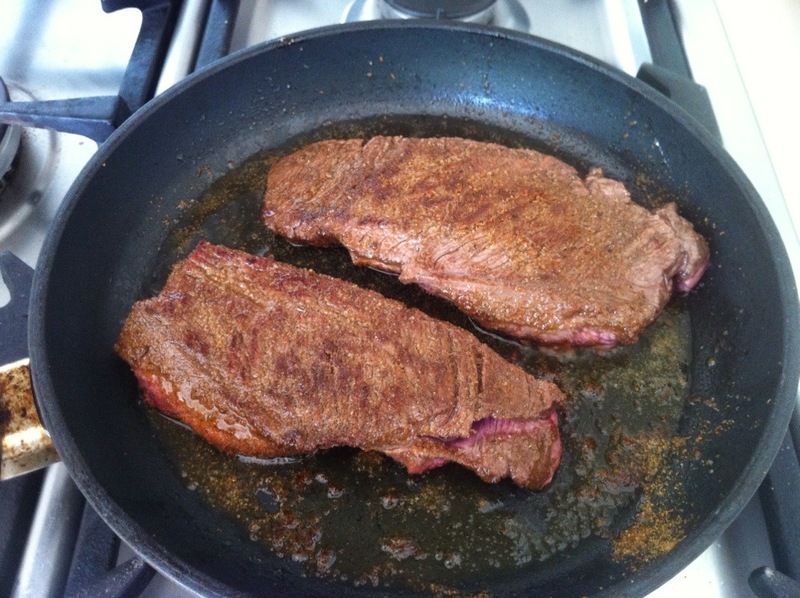 Heat a skillet on medium with coconut oil. Brown the chicken in the skillet, 3 minutes each side. 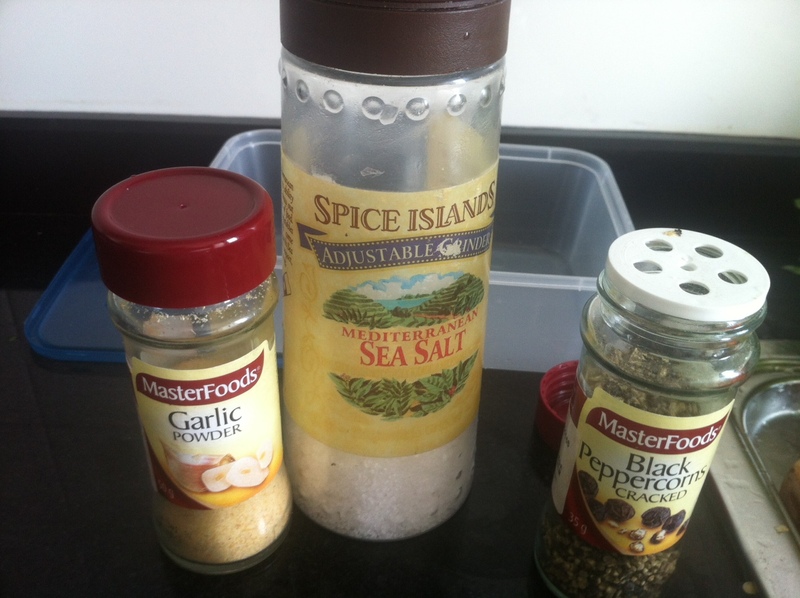 Add to crockpot. Sauté the onions for 2 minutes and then add the garlic and sauté two more minutes. Add to the crockpot. 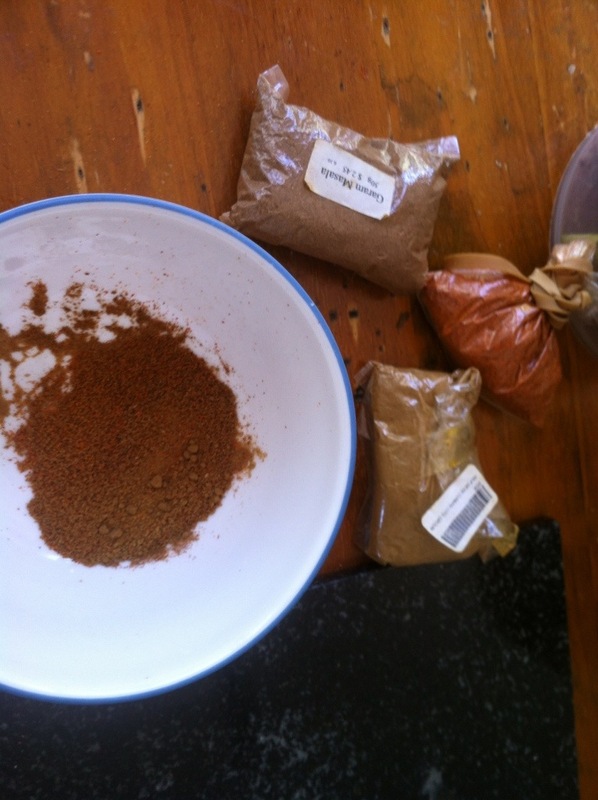 In a small bowl mix the rest of the ingredients. Add to the crockpot. This lunch was FANTASTIC! The entire birth house smelled so yummy! It was very much a winter dinner. Let me know if you try it! In large skillet heat 2 Tbs coconut oil. Toss in pork to brown. 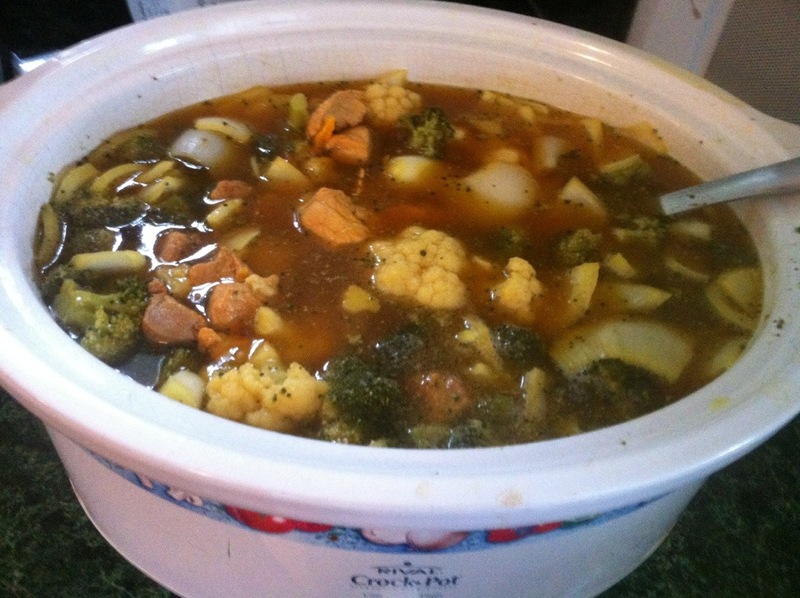 While pork is browning turn crock pot on high (if cooking for 2 hours) on low if all day. 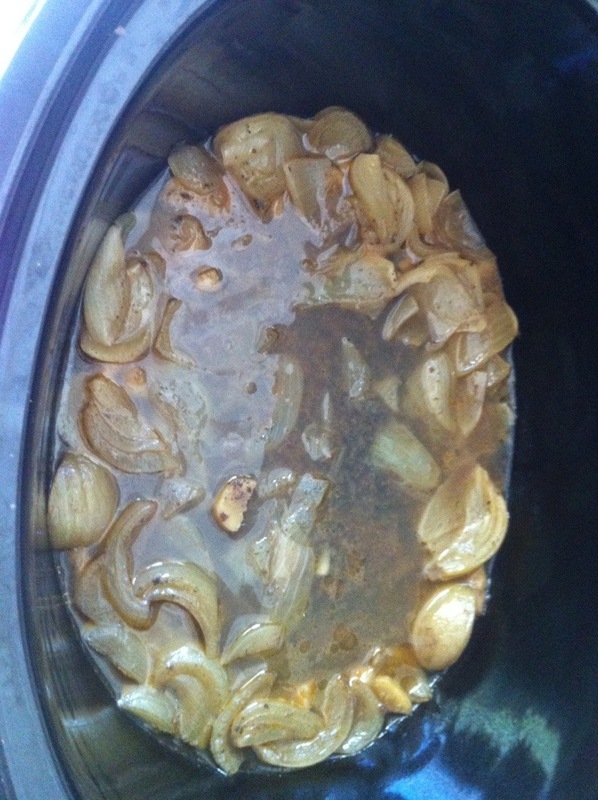 Place the onion and sweet potato in crock pot. Sprinkle on Sazón and pour in veg stock. 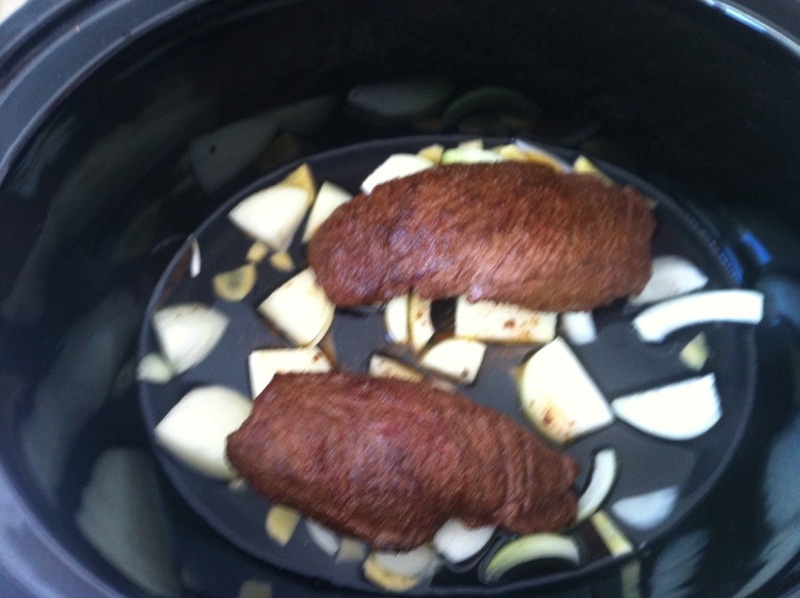 When pork is browned on both sides toss that in crockpot. Stir. 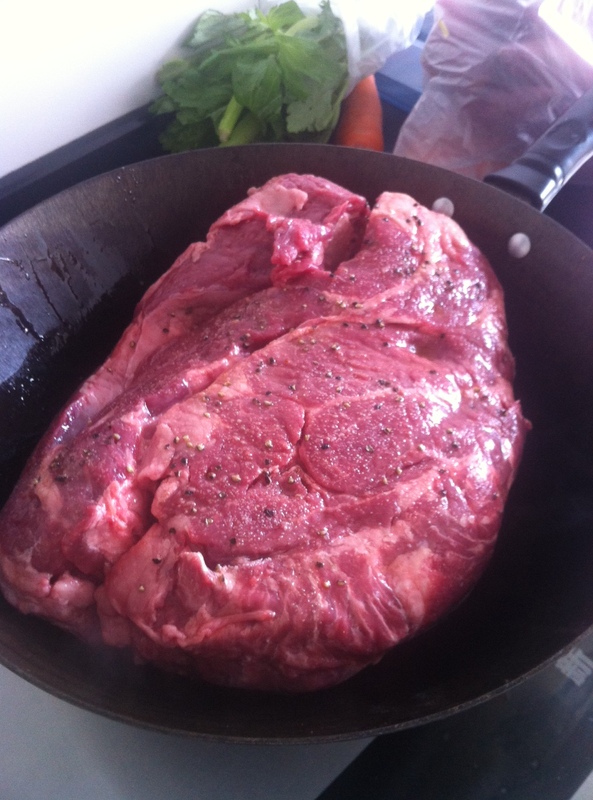 Top up with hot water to cover meat. Place lid and walk away. About 30 minutes before serving toss in the broccoli and cauliflower. So the other night when I made the Coconut Flaxseed Bread that I posted about, I had this half a can of coconut milk left over and had no idea what to do with it… then it hit me… why don’t I pour it in the veggies that are steaming… Mmmm Mmmm Good! Put carrots into pan and pour water over them. Add the rest of the veggies to the pan and pour the coconut milk on top. Preheat the oven (in my case the toaster oven) to 350 F.
Grease up a loaf pan with coconut oil. 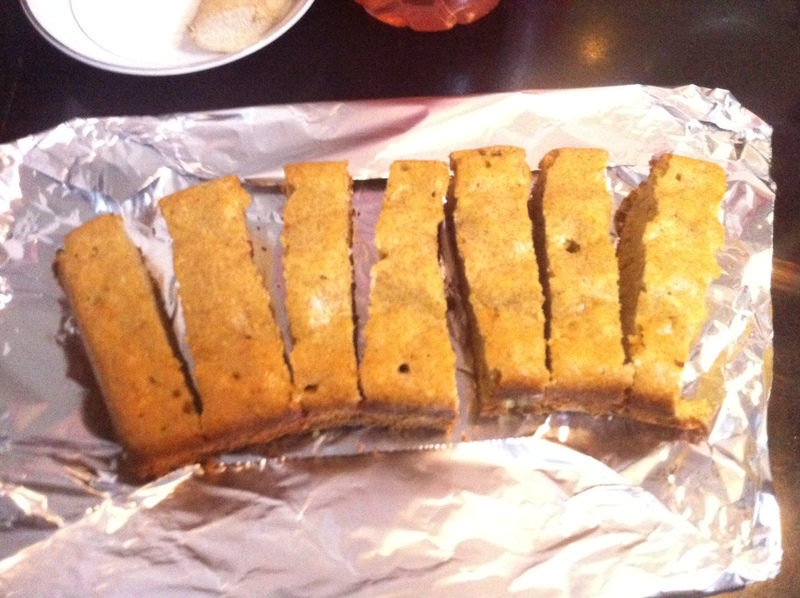 Loaf is done when you stick in a chop stick (hey! I live in China!) comes out clean! This loaf came out browner, sweeter and moister than the last loaf. 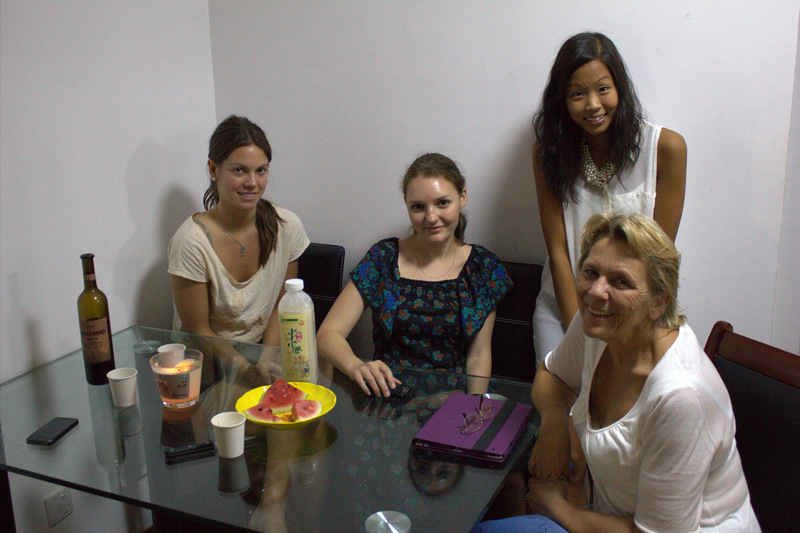 Last week I met 3 Swedish students that are here in Hangzhou to study a semester at the local university. I’m an extrovert (I’m sure most of you figured THAT out by now!) and the young man in the group was wearing a Miami Dolphins cap, so of course, being the Dolfan that I am, I said hello! By the end of the conversation I had invited Jacob, Diana and Hanna to my flat for dinner on Friday. Tatiana, one of my colleagues, also joined us. 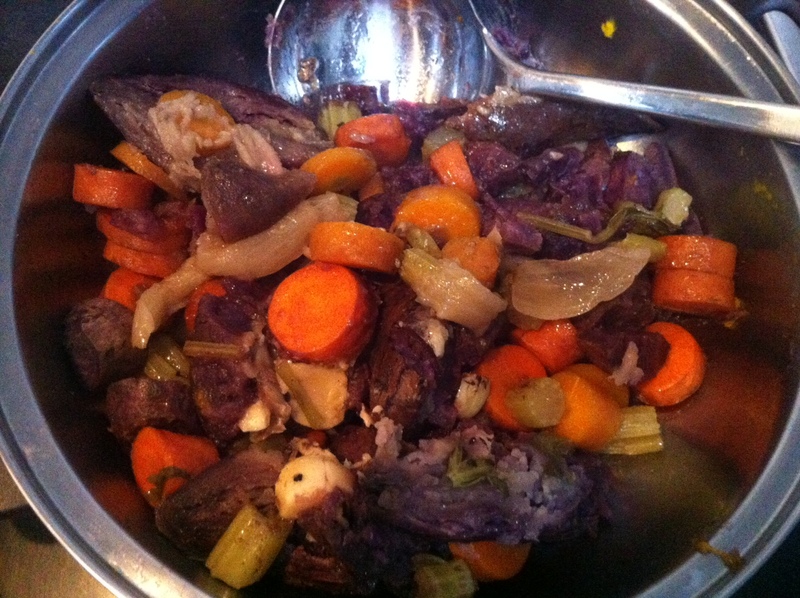 Roasted vegetables – Onions, yam (which ended up being Taro) and carrots **TARO IS *NOT* LOW CARB… just so you know. 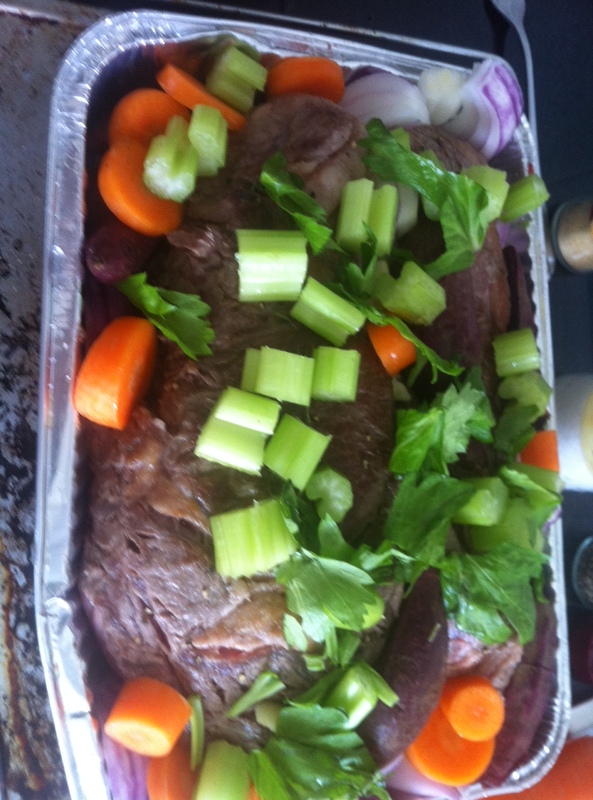 I cooked the roast for 3.5 hours in the toaster oven and it was PERFECT… I had to fight the urge to not consume it before the guests arrived! The meat fell apart with the fork. In the container with the roast I added the onions, taro and carrots. 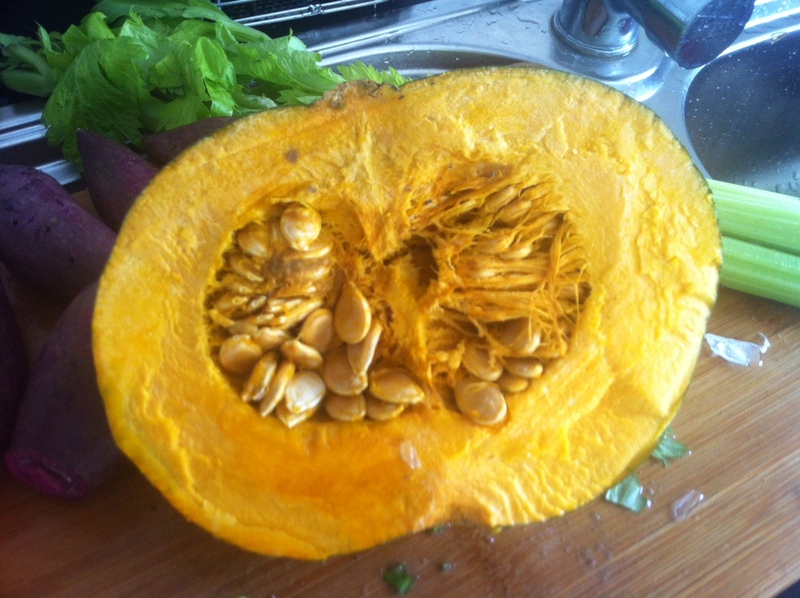 Plan B was removing the flesh from the pumpkin, mashing it, adding in 4 pkts of Splenda, a Tbs of ghee and a tsp of cinnamon… OH MY GOODNESS was this yummy! 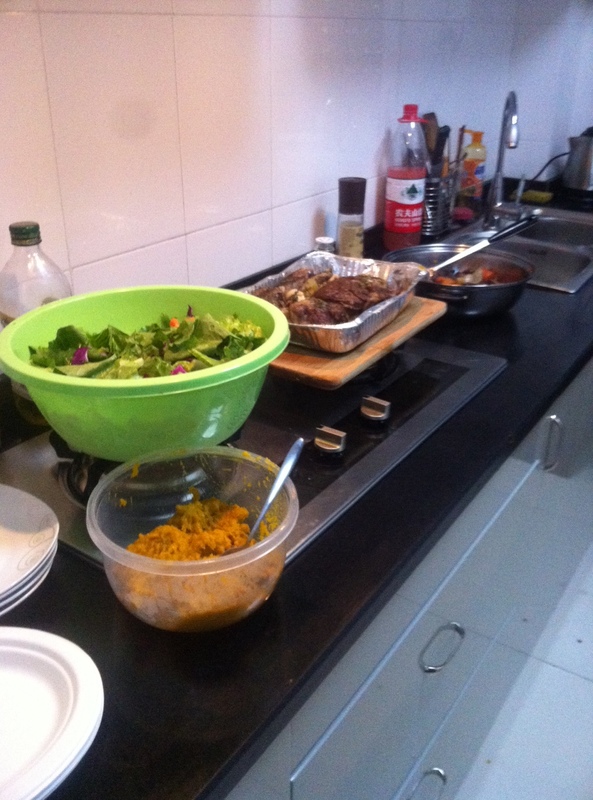 I threw the salad together and welcomed my guests… we had a lovely dinner! Here’s the pics! After everyone left I did a quick clean up and then went for a short 3 km run around the block… perfect way to end the evening! 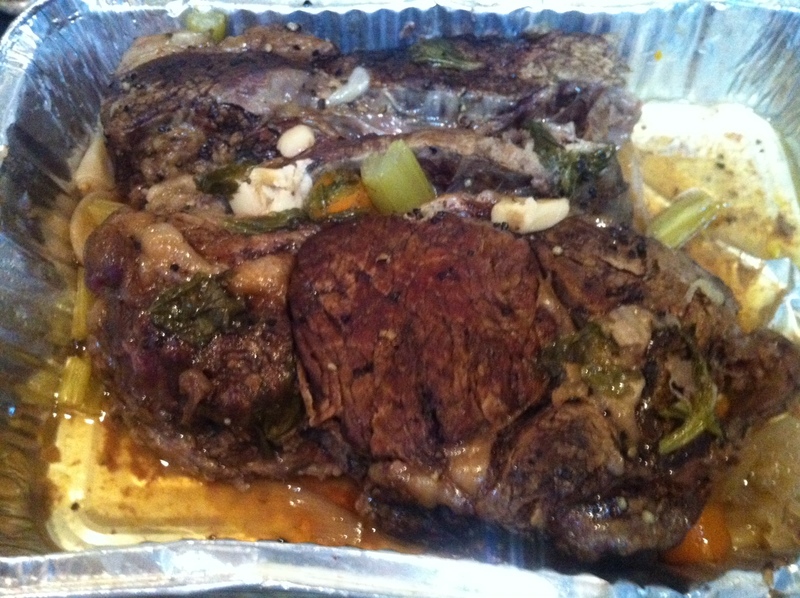 Hunk of prime rib love… Mmm! 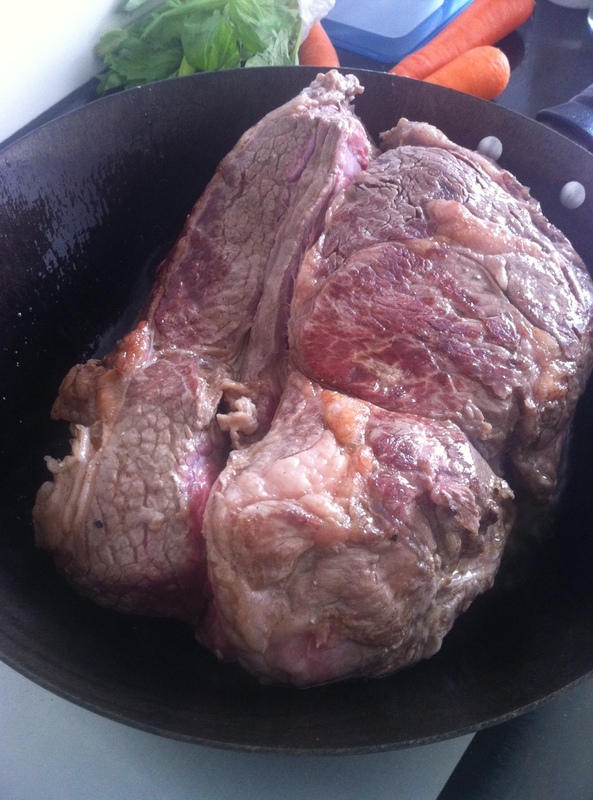 You should always brown each side of the meat before roasting in the oven. Just browning this made the house smell delish! 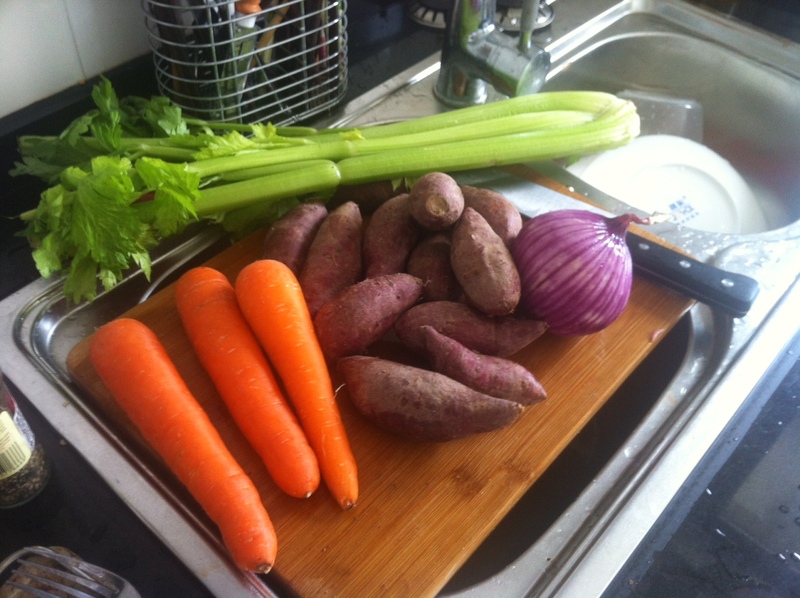 Carrots, celery, taro and onion… perfect compliments to a roast! 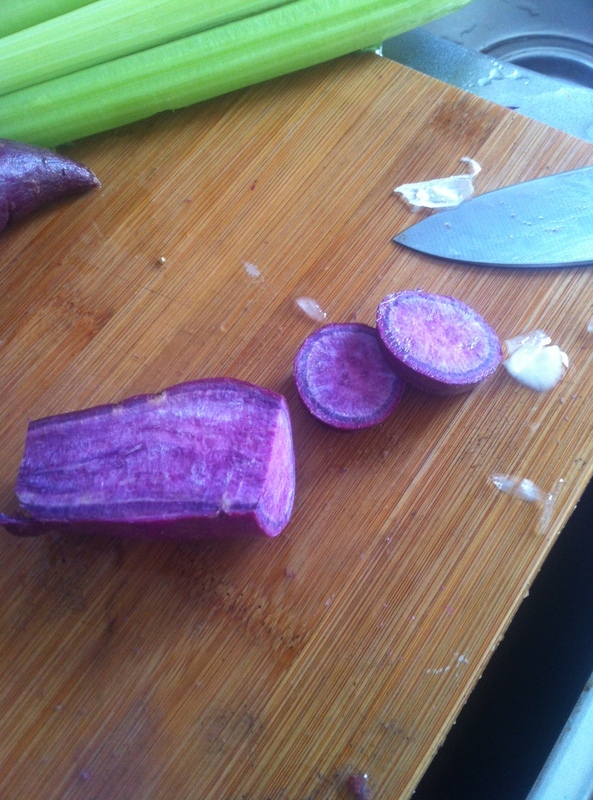 Taro in all it’s purply glory… It’s quite starchy, but has a lot of bang for it’s buck… it’s full of fiber and tastes a bit nutty. Ready for the toaster oven! 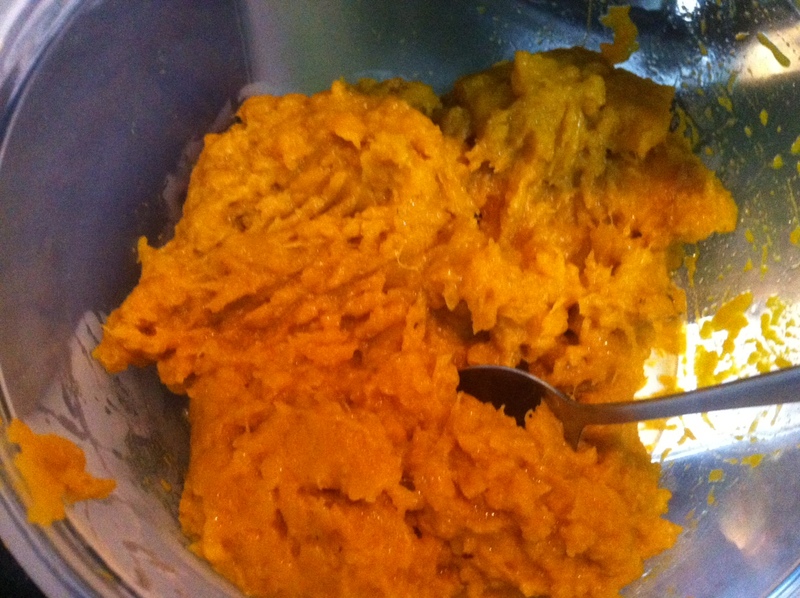 My Un-spaghetti squash… it was yummy anyways! Falling apart with a fork! 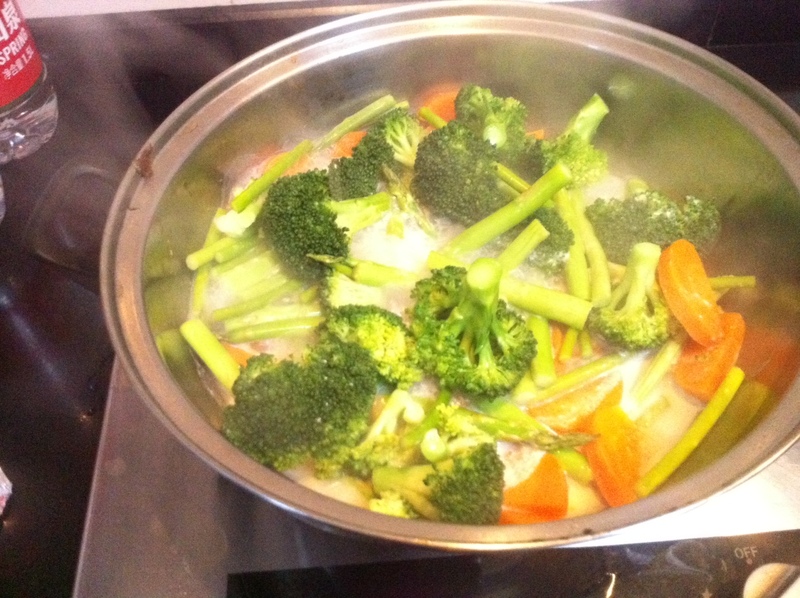 The veggies after I removed from the roasting pan… Nom! 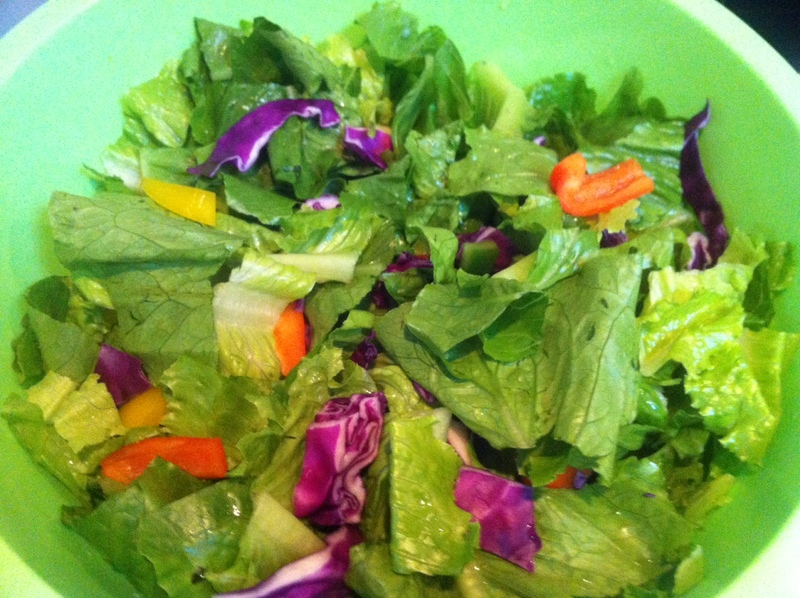 Mixed Salad… I love adding purple cabbage for color and taste! Dinner ready for the guests! Hanna, Tatiana, Diana and Me… Lovely dinner companions! One of the awesome things about living abroad is the people you meet. We have choices in life. We can go about our business and walk around with our eyes averted or we can keep our eyes open and look for new friendships. I choose the latter. I have met so many amazing people from all over the world these past 4 years living abroad… treasures, every one of them and lots of stories I have of my journey, as I head back home for good in 10 days. Do you extend yourself to strangers?